The Cliffs village in Summerlin forms the southernmost edge of this award-winning community. The village is set against a dramatic ridgeline that is its namesake and inspiration for the rugged contemporary architectural style evident throughout all neighborhoods in The Cliffs. Here, Pardee Homes offers two contemporary neighborhoods in keeping with the village’s signature design and architectural aesthetic. The community’s southernmost village, The Cliffs is named for the picturesque cliffs and ridgeline that form its spectacular backdrop. Offering views of the valley, the Strip and the Spring Mountains, The Cliffs is now taking shape on the area’s elevated and terraced landscape that maximizes its spectacular topography. 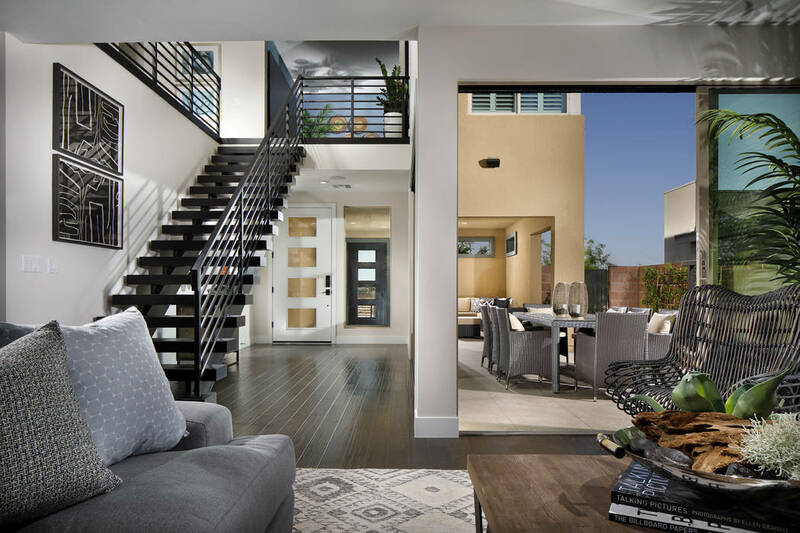 Nova Ridge by Pardee offers homes from 3,172 square feet to 4,413 square feet priced from the low $600,000s with styles that include midcentury modern, desert contemporary and modern Nevada. Floor plans range from 3,172 square feet to 4,413 square feet and include Pardee’s LivingSmart energy-savings features and options. Homes are priced from the mid-$600,000s. Nova Ridge’s Plan Two recently took home top honors at the Southern Nevada Home Builders Association Silver Nuggets award, winning for Design and Architecture as well as for Best Single Family Detached Home in its size and price category. Nova Ridge homes offer from three to five bedrooms, 2½ to 4½ baths. Special features include courtyards and back patios that create abundant indoor/outdoor living spaces to take advantage of the area’s natural beauty and extend living areas outside. Plan One spans 3,172 square feet with up to three baths, covered patio off the kitchen and dining area and a courtyard entry. Plan Two is 3,263 square feet and offers four bedrooms, 3½ baths, porch entry, den, covered patio and optional GenSmart Suite. Plan Three, at 3,679 square feet, features a two-story floor plan with up to five bedrooms, 4½ baths, courtyard entry, office or optional GenSmart Suite, optional lounge, spacious great room, game room and covered patio. And finally, plan four spans 4,413 square feet on two stories. It offers five bedrooms, 4½ baths, spacious kitchen and great room area, lounge covered patio, loft, optional decks off master bedroom and third bedroom and optional GenSmart Suite. Terra Luna offers three floor plans ranging from 2,985 square feet to 3,265 square feet with up to five bedrooms and four baths, and priced from the high $500,000s. One- and two-story designs embody midcentury modern elevations consistent with the village’s overall theme. Terra Luna Plan One spans 2,463 square feet in a single-story design with three bedrooms, 2½ baths, den, covered patio and two-car garage, while Plan Two measures 2,985 square feet with up to four bedrooms and 3½ baths, outdoor lounge, covered patio, optional den and three-car tandem garage. Terra Luna Plan Three encompasses 3,144 square feet with four bedrooms, 3½ baths, den, three-car tandem garage and covered patio. The home includes a downstairs bedroom and bath, optional wet bar in the den and optional 9-foot stacking doors from the dining and great room to the covered patio. Terra Luna Plan Four measures 3,265 square feet with four bedrooms and 3½ baths, bonus room, lounge, covered patio, two-car, plus swing bay garage. A fifth bedroom and fourth bath are offered instead of the lounge. The Cliffs village is home to 11 neighborhoods, encompassing more than 1,700 homes. Abundant village amenities include Shelley Berkley Elementary School, Faiss Middle School, Bishop Gorman High School, Faiss Community Park, Wet ‘n’ Wild water park and Aquatic Springs Indoor Pool. Trails and a park are in the planning stages. For more information, visit www.Summerlin.com.